Oje Ken Ollivierre, popularly known by his stage name, Protoje is among a group of young reggae artists from Jamaica, branded as the Reggae Revival. Chronixx, Kabaka Pyramid, Dre Island, Jah9, Jah Bouks, Kelissa and the aforementioned Protoje, has ignited a torch in people’s hearts and is confidently lighting the path for an entire generation of youths to rediscover roots and culture within reggae music. Protoje and fellow collaborator, Chronixx, in large part, have led this revolution since their recent hit single, “Who Knows”, featured on Protoje’s 2015 release, Ancient Future. Continuing to ride the wave of momentum from his Ancient Future album release, Protoje will once again hit the road to spread the sound of his native Jamaica to the masses. Protoje spent the 2016 spring months touring as direct support to American reggae band Rebelution, which spawned a collaborative track titled, “Inhale Exhale” on the California-based band’s June 3rd release of Falling Into Place. Protoje also headlined his own summer tour with stops in Boston, Philadelphia, New York, Chicago, Washington D.C., Denver, Phoenix, Las Vegas and Los Angeles, as well as featuring tour stops in Toronto and Quebec City, along with many other auxiliary markets in North America. Now, Protoje is poised to join forces with one of the leading American Reggae-Rock fusion bands, Iration. Iration has quickly turned from genre newcomer to touring veterans and accomplished recording artists. Although, internationally, Protoje might be more widely recognized. In the United States, fans have been selling out venues across the country to see Iration live for nearly a decade. 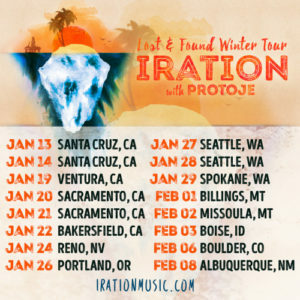 Without a doubt, 2017 will be kickstarted with a major collaboration tour between Iration and Protoje. The tour begins on January 13th and will run through February 10th with the tour finale in Las Vegas. Some key highlights on the upcoming tour will include six dates in California, three shows in Washington, two in Montana, a headlining appearance at the Winter Rock Reggae Festival in Utah, as well as dates in Colorado, Arizona and New Mexico, among others. For more information on Protoje, follow the links below.